Made specifically for the Youtube nation in mind. The need for high-def video recorders seem at it’s peek for the ever growing number of homemade family videos and such. This is not actually a high-def videocam but at 640×480, the Flip Video’s resolution still packs a punch on a 60-inch, 1080p set. With 1GB of internal flash memory, one hour of video, the Flip Video is powered by AA batteries. That is very simple enough to capture a priceless moment of your friend falling off the stairs to be posted later at Youtube. To store your videos in your PC, flip out the built-in USB connector and hook it up in your PC or Mac. Now You can copy the videos to your PC for later playing and storage, but if you want to impress your friends, just fire up the app that’s stored on the unit, a simple web-based interface that lets you view, edit, or share your videos. Upload you videos to the partner sites YouTube and Grouper.com directly from the device. This fun, sleek Videocam lets you view, organize, clips and photos locally via it’s clip-based library system, capture still photos from video clips, email videos and video greeting cards, create custom audio and video mixes as a sort soundtrack and movie of your life. Have fun taking pictures and videos with the Flip Video 1GB and also there’s a 512mb version which stores up to 30 mins of video. 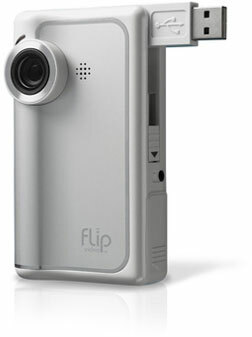 The Flip Video has a 1.5 inch color screen for instant viewing, viewed full 30 fps video quality at VGA (640×480) resolution, also the MPEG-4 recorded video files are saved in AVI format. PS3 Under $400 in Japan?